Family members are frequently ignored and their concerns dismissed as therapists put their primary attention onto the mental illness of the borderline or narcissist client. This workshop will focus on helping these many overlooked, neglected and misunderstood family members to find understanding, improved mental health, and to learn more effective coping skills to deal with their unique situation. Every person with Borderline or Narcissistic Personality Disorder dramatically affects many other people with their dysfunctional behaviours, including parents, siblings, one or more spouses, and children as well as friends, co-workers, neighbours, etc. These family members are more likely to come into therapy than are the borderline or narcissist person. They are also very likely to be on anti-depressant and anti-anxiety medications. It is essential to be able to effectively help these numerous clients who may be greatly distressed and their lives disrupted by borderline or narcissist behaviours. 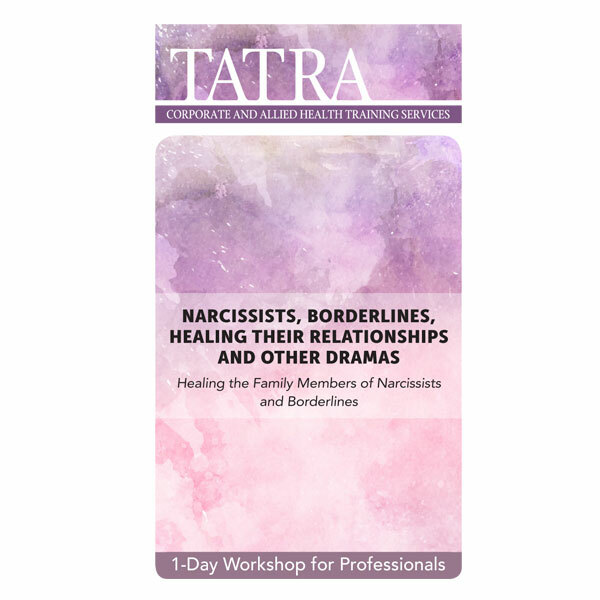 Traditional family therapy techniques do not work effectively with these families because of the emphasis on communication, empathy and cooperation, which the borderline or narcissist is often unable to do and feels highly resistant to doing. Family members are frequently ignored and their concerns dismissed as therapists put their primary attention onto the mental illness of the borderline or narcissist client. This workshop will focus on helping these many overlooked, neglected and misunderstood family members to find understanding, improved mental health, and to learn more effective coping skills to deal with their unique situation.